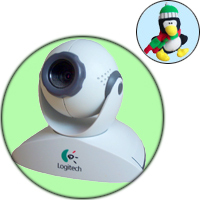 The QuickCam Pro is a VGA quality colour webcam from Logitech. It is small, neat and works well. It is well priced at around 70 GBP. The webcam comes with drivers for Windows 98. XP drivers and software can be downloaded from Logitech's website. The Windows software is very good, with facilities to set up webcams, shoot video clips, stop-motion and more. Logitech currently do not support Linux, nor it seems do they have any plans to do so. They are also hanging on to their specs. preventing third-party drivers being developed. The best way to get Linux support from Logitech is for as many of us as possible to request (nicely) that they start doing so. The good news is that there is a Linux driver under development. This is capable of displaying a live image from the camera, but unlike the Windows driver, there is no automatic contrast control, so getting an intelligable picture takes a little fiddling. See the nw802 for more details.